How Does Kansas City Compare to Peer Metros? A few months ago we discussed how the Kansas City Metro was lagging some peer metros in employment growth during the economic recovery. We promised to take a closer look at employment change by industry to see if we can explain why that is happening. 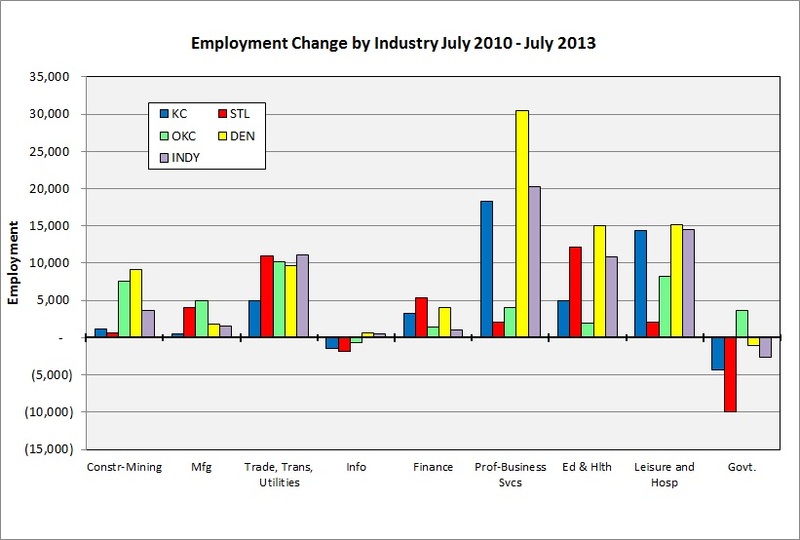 The chart below compares employment change by industry in Kansas City metro and four peer metros (St. Louis, Oklahoma City, Denver and Indianapolis). This data is not seasonally adjusted, so we had to pick one month to eliminate any seasonal fluctuations. We chose to compare July 2010 with July 2013 to get a clear “before-and-after” picture, as the economy stopped losing employment and started growing again in February 2010. Also, we decided not to include the “Other Services” industry to simplify the chart; employment change in that industry was relatively small in all metros. Kansas City’s strongest employment growth over this period has been in the Professional-Business Services and Leisure-Hospitality industries. These industries are also driving employment growth in Denver and Indianapolis, but not adding as many jobs in St. Louis or Oklahoma City. Kansas City appears to be lagging in employment growth in four industries: Construction-Mining, Manufacturing, Trade-Transportation-Utilities and Education-Health Services. We added fewer than 12,000 jobs in these industries over three years, less than half of what the nearest peer metro added. Declines in Retail employment are primarily to blame for our lackluster performance in Trade, Transportation and Utilities. Employment in the Education and Health industry is growing, but at a slower pace than all peer metros except Oklahoma City. There is no obvious explanation for this slow rate, but we’ll keep an eye on this industry to see if this is a long-term trend. In our earlier post, we noted that the Kansas City and St. Louis metros were still in the red in terms of employment — having regained only 73 percent and 37 percent, respectively, of the jobs lost in the Great Recession — while peers like Denver, Indianapolis and Oklahoma City have not only regained all of their lost jobs but added more. Strong industry clusters may be part of the explanation, but not the only explanation. It could be that employers in the Show-Me State need just a little evidence that the economic recovery is going to continue before they resume hiring.